Acne has profound effects on people’s lives, effecting social life, education, and even employment. Acne is also one of the most common skin conditions. Traditional Chinese Medicine takes a holistic approach to the diagnosis and treatment of acne by identifying specific imbalances in the body, and then using acupuncture and Chinese herbs to correct them. Correcting the imbalance does not mean simply treating the symptoms or masking the condition, but rather correcting the root of the problem by encouraging self-healing of the body. The key is to correctly identify the imbalance that is causing the acne. “Throughout my life I have struggled with acne on both my face and body. I felt like I had tried just about everything that Western medicine had to offer – accutane, light therapy, facials, antibiotics – you name it, I’ve tried it! Finally, I looked into acupuncture since other methods certainly did not seem to be doing the trick. Much to my surprise, I started seeing results almost immediately – in more than just my skin. Joe is such an amazingly calming force and is extremely open-minded and intelligent – I can’t recommend a better acupuncturist! Acne is a condition which begins when a hair follicle in the skin becomes clogged by sebum. Acne is most common in areas of the body with many sebaceous glands, such as the face, back, and chest. The clogging can result in a pimple. A clogged follicle may become infected from bacteria which causes inflammation. The inflammation leads to the development of pustules and papules. Sometimes cysts may develop. Acupuncture and Chinese herbs help to reduce the cycle of acne development by regulating the hormones that effect skin secretions. It can also help to reduce inflammation, and bacteria. Chinese Medicine and Acupuncture are holistic therapies that can help people with their skin as well as improve overall wellness. This is also called comedonal acne. In Chinese medicine, dampness and heat are the main cause of white heads and black heads. Chinese herbs and acupuncture to clear dampness and heat can be effective at treating whiteheads and blackheads, such as huang qin or sang bai pi. Other signs of dampness may be oily skin, fatigue, and poor digestion. Inflammatory acne occurs when pimples become infected and inflamed. In Chinese medicine, heat is a significant cause of inflammatory acne. Heat imbalances are reflected in red skin as well as red, inflamed papules and pustules. If there is very bad inflammation, it is called “toxicity.” The acupuncture and herbs that clear away the heat have been shown to have many antibacterial and anti-inflammatory properties, such as jin yin hua and lian qiao. Heat can also manifest as night sweats, excessive thirst, and constipation. Cystic acne is a severely inflamed type of acne. The cysts are large,lie deep in the skin, and can be painful. In Chinese medicine, this is related to toxins and stagnation. Pu gong ying (dandelion) is one of the herbs that may be useful in this type of acne. Many women find that their acne flares up during the premenstrual stage of their cycle. . The acne is often a combination of whiteheads and blackheads with some inflammation involved. In Chinese medicine, hormonal acne can be related to stagnation, which is a lack of circulation in the body. Stress may also be a factor in the development of hormonal as well as inflammatory acne, which is a common cause of qi and blood stagnation. Acupuncture and herb treatments would focus on moving the qi and blood stagnation. Herbs such as chai hu and yi mu cao can help move the qi and blood to stop acne. Another benefit of acupuncture is that it helps the body to manage stress and encourages the entire system to relax. 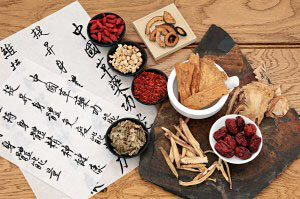 Chinese herbs work to regulate hormone imbalances, improve digestion, control bacteria levels, and decrease inflammation. By removing the imbalances causing the acne, acupuncture and Chinese herbs disrupt the acne cycle and allows the body to heal itself.